Red, green. Alright. Red, red, yellow! Phew. Cleared. Purple? Wait, now blue too?! Man, keeping the screen from filling as multi-colored rectangles come crashing down is not easy. Sure is fun though, and it doesn’t take long before the pace reaches borderline chaotic levels… so many colors, just waiting to be tapped! 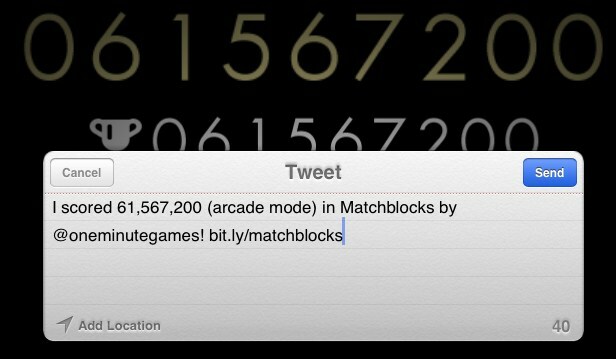 Unlike most other fast-paced block puzzlers, Matchblocks doesn’t task you with creating lines to then clear them. Instead, you’ll be tapping color sequences to tag rectangles, causing them to disappear once completely marked. 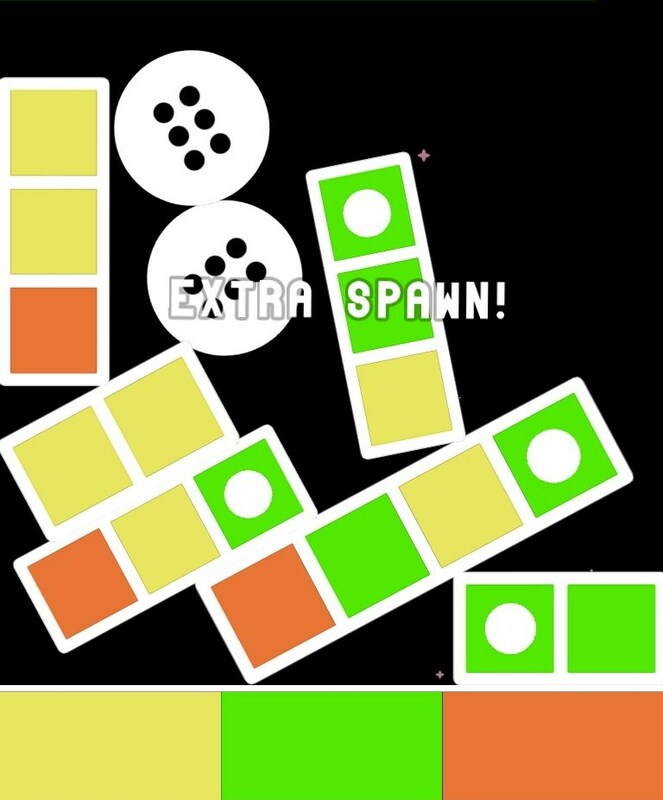 It’s very easy to get the hang of and everything starts out simple, throwing basic yellow/green combinations at you. But it’s not long before you level up, at which point the game adds another color, and another, and… another! Tapping away combinations of two colors, easy enough. Three? Meh, doable, but four? At this point, the pace quickens, the tension rises and only those truly skilled will be able to last for long. Practice does make perfect though, and sooner or later you’ll be tapping colors, clearing blocks like nobody’s business, adrenaline going crazy! Oh and that’s just classic mode. While none of the other four ditch the color matching mechanic, they do tweak the rules enough to make each play vastly different. Arcade, which is my favorite by far, puts the level changing on a 20 second timer and limits the number of colors to two. This makes for a more focused experience as there’s less to deal with, but don’t mistake that for a less challenging experience, as arcade also manages to keep you on your toes just fine… and then some. Time trial, on the other hand, is a more puzzle-centric thing. A slew of rectangles drops down immediately, and then your job’s to clear the screen before time runs out. Stressful? You bet! Zen, as the name implies, is an endless mode with a constant difficulty – perfect for when you just want to relax, tapping the night away. Last but not least, is ‘pure’. I’m not entirely sure what that one’s all about though, as the game neither described nor made it clear during my time playing. Various obstacles also come crashing from the top at random intervals, just to mess with your color-tapping groove. These range from simple ‘tap x times to destroy’ to ones that trigger random events and some even remove entire blocks. The value of that last one is certainly not to be underestimated, as it has saved me on countless occasions when the screen was almost filled with those nasty rectangles. Destroy obstacles on the board, collect bonuses and make combos. Ah yes, combos. In order to nail that remarkable high score, chances are you’ll have to dip into what I like to call a ‘risk vs. reward’ system. To trigger a combo, all you have to do is clear two or more blocks simultaneously; something that, as you can probably imagine, comes at a cost. See, more blocks on-screen obviously means greater combo potential, but it also brings you that much closer to the inevitable failure state. Hence, risk vs. reward. Now, I always try my best not to ignore flaws when reviewing a game, simply to make sure nothing gets overlooked, and that my criticism is properly balanced. Although in this case, I honestly can’t think of anything. Well, some might find it a tad repetitive, even with five different modes, but that’s pretty much it. Aside from that potential issue, I’d highly recommend grabbing Matchblocks and blasting some rectangles. Little known fact: rectangles are evil! Matchblocks is available for iOS [version reviewed] (iTunes, $1.99 with a demo) and Android (Google Play, $0.99 with a demo). Note: the full iOS version is free until March 1st, 2014.